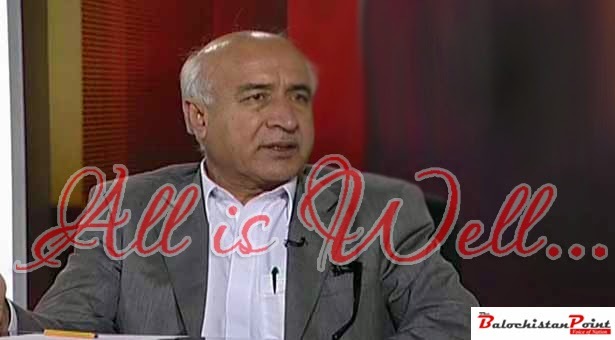 All is well in Balochistan if we believe the regular statements issued by Chief Minister of Balochistan, Dr. Abdul Malik Baloch. The situation on the ground, however, is totally opposite. Yesterday three terrorism incidents took place in Quetta city. In first incident 8 innocent and poor vegetable vendors belonging from Hazara community were gunned down due to their faith. Second incident targeted a convoy of security forces and the third one was a direct but unsuccessful assassination attempt on Molana Fazal ur Rehman, one of the most influential national leaders of Pakistan. This proves that all is not well in Balochistan. Couple of days back Dr. Malik clearly stated in a press statement that security situation in Balochistan is better than other provinces. He has made other similar statements many times in recent past. Luckily for him, at that time the terrorist decided to remain inactive due to tactical reasons and Dr. Malik’s claims went unchallenged. Latest surge in terrorism activities in Quetta show that law and order situation is deteriorating in Balochistan and Dr. Malik is in State of denial to say the last. Since coming to power in June 2013, Dr. Malik has been associated with one failure after another. Mysterious religious militant outfits have surfaced in Makran division during last 6 months and Dr. Malik has completely failed to protect even his home town of Turbat. Private schools were closed for more than 3 months in Panjgur due to threats from a suspicious religious extremist group. Even now the schools in Turbat and Panjgur receive threats on regular basis. Dr. Malik has also failed to persuade the real decision makers in this country to start meaningful dialogue with Baloch separatists. The issue of political solution of the Balochistan conflict has been put in cold storage and Dr. Malik is the one to be blamed for it. Furthermore, Dr. Malik and his coalition Partner PKMAP have deliberately prevented the transfer of power to local bodies. The stories of Bad governance, corruption and nepotism are surfacing in growing numbers. Recently a person was appointed as Principal of University Law College, who is younger than the stipulated age for the office of Principal. This is just one such example of many unfair political appointments that have taken place duing the administration of Dr. Malik. Moving to the political front, Dr. Malik failed to form his cabinet for over four months. Even now there are serious disputes among the coalition members in Balochistan government. Members of PML-N and PML-Q blame Dr. Malik for interfering in their domain. Abdul Karim Nosherwani, One of the coalition members, has even asked Dr. Malik to resign from the office of chief Minister. Dr. Malik should accept the reality and refrain from making claims which can’t be substantiated. He should prevent his coalition partners, specifically PKMAP from political appointments in different organizations. Last but not the least; if Dr. Malik couldn’t take action against the perpetrators of the Hazara Killings then he has no moral right to remain the chief Minister of restive province of Balochistan. Anyhow, the legitimacy of Dr. Malik as chief minister of Balochistan is in jeopardy because the case of election rigging on his constituency, PB-48, is pending in Supreme Court.